Have to agree with Kiwi,magic. I assume that Bill's photograph is of the hillside adjacent to Hartshead Pike. I have often wondered what this strange structure is, set a few yards from the Pike - does anyone know? That's the base of the earlier Hartshead Pike monument, Trevor. Would you be aware of how much is known about the earlier monument, Martin? I can't recall ever seeing a picture of it (as in the whole version) and clearly it would be from an era before photography. Are we left with a bit of a mystery? I think the word "monument" may be a little too grand a description of the earlier structure. The spot is supposed to line up with the summit of Brown edge and the rising sun on mid-summer's day and was the site of a beacon. A tower was built on that spot in the early 18th century, or possibly earlier. It may have been built partly of timber beams with lath and plaster walls. 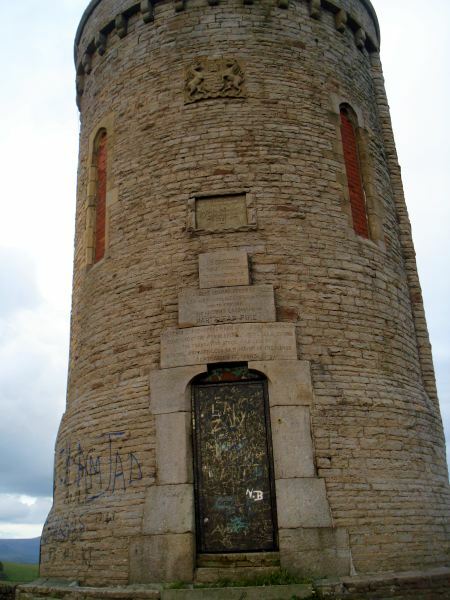 It must have suffered from vandalism because, in 1750, the Court Leet issued a statement that "if any person shall any ways abuse Hartshead Pike either with stones or clods or any ways deface the weather mark, shall, for every such offence, lose 3s 4d each." A new tower was completed "in stone" just 8 years later on the site of the present tower. This new tower had a hart's head weather vain on its top. 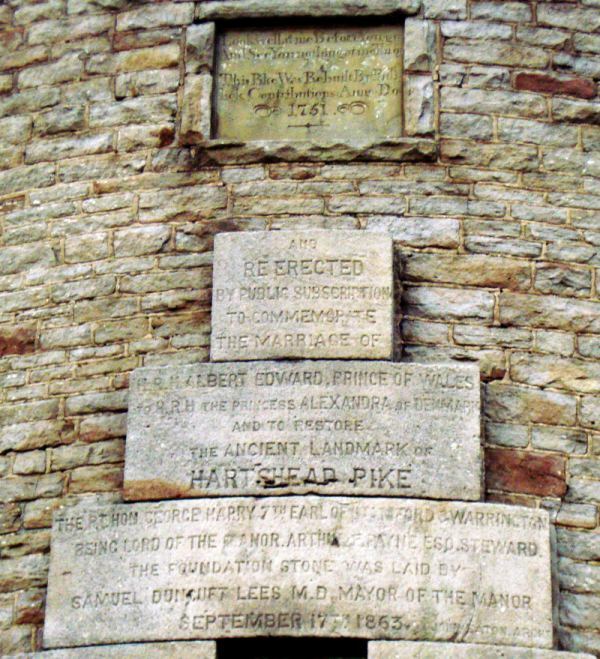 A stone inscription read "This Pike was re-built by publick contributions Anno Domini 1751." and "Look at me well before you go, And see you nothing at me throw!" However, this new tower succumbed not to vandalism but to poor construction as, in 1794, a wide crack 18 inches wide appeared from top to bottom of the tower and it was soon in ruins. It was not until 1863 that construction of the present tower began. The previous inscription was incorporated, along with another: "Re-erected by Public Subscription to commemorate the marriage of HRH Albert Edward, Prince of Wales, to HRH Princess Alexandra of Denmark - and to restore the ancient monument of Hartshead Pike". A final inscription reads "The Right Hon George Harry 7th Earl of Stamford and Warrington being Lord of the Manor. Arthur F Payne Esq Steward. The foundation stone was laid by Samuel Duncuft Lees MD Mayor of the Manor September 17th 1863. John Eaton Architect." The structure that now stands on the site of the original tower was made up from stones and millstones from the nearby Marlands Sand Mill. This also goes to show that the mistaken practice of using the word Pike to refer to the the tower rather than the hill itself dates back to at least 1750! Indeed. 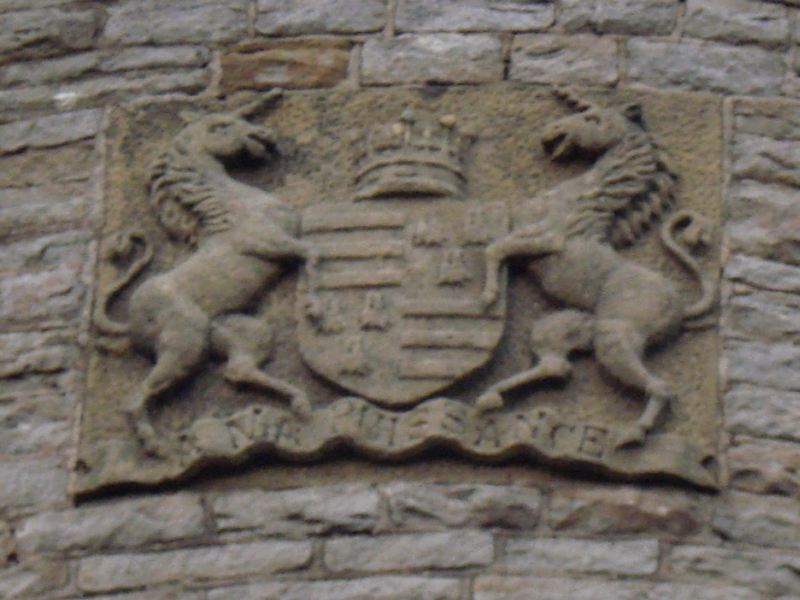 Didn't someone say it was a coat of arms relating to the Earl of Stamford? Brings back memories of childhood, Bill. Absolutely love Parkin and Treacle Toffee. Haven't seen or heard of treacle toffee in years. Yum!!! !